Puff pastry is one of the most versatile ingredients to have in your kitchen. It can be frozen for months – on call for that last minute dish – and it can be cut, shaped and flavored for a near endless variety of sweet and savory foods. Puff pastry twists are a whimsical, yet elegant, way to impress your friends, family and dinner guests when you host your next cocktail party, dinner party or dessert party. Give these appetizers and dessert recipes a try and come up with your own puff pastry twist renditions. hours – or you can hasten the thaw on your kitchen counter in 30 minutes – unroll the sheets and cover with a sheet of plastic wrap. Following are two basic puff pastry twists recipes along with both savory and sweet variations. Sweet or savory, puff pastry twists can be served in a delectable array of ways. Stand puff pastry twists in glasses for guests to easily grab. 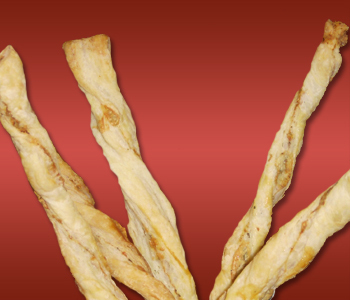 Criss-cross puff pastry twists on serving platters along with other appetizers or desserts. Stake puff pastry twists in savory or sweet dips. Use savory puff pastry twists as garnish for seafood, poultry, meat or vegetable dishes. Serve savory puff pastry twists with salads, soups or stews. Use sweet puff pastry twists as garnish for slices of cheesecake, mousse or custards. Serve sweet puff pastry twists with sundaes, milkshakes or other ice cream treats. Serve puff pastry twists with wine, tea, coffee or hot cocoa as a new spin on an after-dinner digestif. pastry straws go impeccably with white or red wines as well as chic martinis. 1. Preheat oven to 400 degrees F. and spray two large baking sheets with nonstick cooking spray. 2. Unfold one sheet flat on a lightly floured counter or pastry board. Use a rolling pin to evenly flatten sheet into a 10 by 14 inch rectangle. Use a sharp knife to cut rectangle in half crosswise. Brush both halves with the egg and sprinkle one half with flavorings. 3. Place the second half, egg-side down, on top of the flavored half, making sure to align the edges. Use the rolling pin to roll over the sheets to seal. best the day they are made but they can be stored in an airtight container at room temperature. accompaniment for a hot drink such as coffee, tea or hot cocoa, and they can be staked into cold treats such as milkshakes, smoothies or even a simple glass of milk. 1. Preheat oven to 350 degrees F and spray two large baking sheets with nonstick cooking spray. twists are best the day they are made but they can be stored in an airtight container at room temperature.